I am needing a Business Flyer for my Cleaning Services. 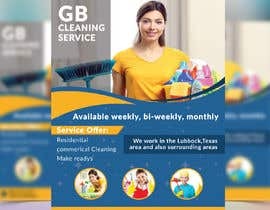 I need a catchy saying to catch my customers Attention: The company Name is GB Cleaning Services. I offer Residential, commerical Cleaning, and aslo Make readys. Available weekly, bi-weekly, monthly. my business is reliable and friendly. We work in the Lubbock,Texas area and also surrounding areas. I have reasonable rates. they can call 806-252-2553. All this information will need to be incorporated in the flyer. Ok. Thanks for the clarity. Should be done in a few minutes.